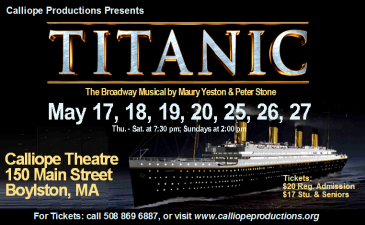 Titanic, the exciting Broadway block-buster production with music and lyrics by Maury Yeston and a book by Peter Stone, garnered five Tony Awards - including the award for Best Musical in 1997. Calliope’s production of this show is a 2012 ensemble version that uses 20 performers to portray all 50 characters, with an abstract set design, projections of the ship and its passengers, and orchestrations designed to make the score sound as though it is being played by the ship’s band. Thanks to the Worcester Telegram for a Titanic feature article. Thanks again to the Worcester Telegram for a floating review. Find all Titanic memories in our Gallery.